Pop quiz: Which is faster, the Atom Z3735F or the Atom Z3735G? If your eyes are glazing over, you’re not alone, because even hard-core geeks get confused by Intel’s naming convention for the Atom chip family—which is why they’re rebranding it. New Atom chips will have the X3, X5 and X7 designations, much like with the Core i3, i5 and i7 brands. 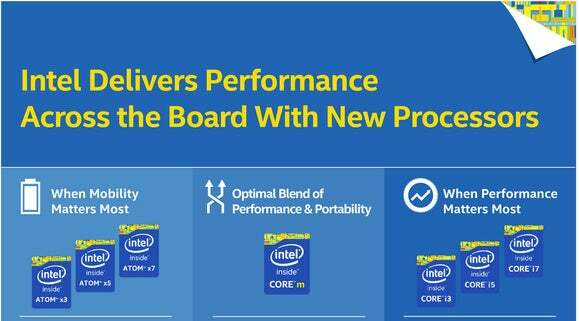 An Atom X3 will deliver good performance, X5 will be better and X7 will be the best, an Intel spokeswoman said. For average mobile device buyers, chip names typically don’t play a role in buying decisions. But chips are an important measure of device performance for technically savvy buyers and developers. Intel’s name change comes ahead of the Mobile World Congress trade show, where Intel is expected to announce new mobile chips. It’s likely that X3 will be the formal name for Atom smartphone chips code-named Sofia, while the Atom X5 and X7 will be names for tablet chips code-named Cherry Trail. The new naming scheme could also help Intel establish a consistent identity for its non-PC chips. Some Intel PC brands like Core and Pentium have a dedicated following, while the uninspiring Celeron brand brings up images of low-cost PCs with limited capabilities. In 2009, Intel similarly renamed its Core processors, a move met with some opposition among chip enthusiasts. The resistance quickly crumbled as the new names caught on. Considering how confusing the current Atom chip names are, any change will likely be welcomed by chip enthusiasts and discerning mobile device buyers alike.